Royal Armouries Collections Website Design and Build - Gooii: Award Winning Website Design & App Development Nottingham. iPhone, iPad & Android Apps. Virtual Reality & Augmented Reality. The Royal Armouries is the United Kingdom’s national museum of arms and armour, and one of the most important museums of its type in the world. They have a long history, dating back to the Middle Ages and the celebrated core collection originated in the nation’s working arsenal, which was assembled over many centuries at the Tower of London. The Royal Armouries are heir to one of the oldest deliberately created visitor attractions in the UK. Objects were being arranged for display to visitors as early as Queen Elizabeth’s reign in the 16th century. Their collection of about 75,000 items – excluding approximately 2,700 loans to other bodies – is now displayed and housed in our historical home at the White Tower in the Tower of London but also at our purpose-built museum in Leeds, and at Fort Nelson near Portsmouth. Since 2005, the museum has also managed the national collection of firearms, started in 1631 by Charles I and assembled by the British Army, now housed at the National Firearms Centre. It currently employs 183 staff and receives nearly 2 million visitors a year across the three sites, who, except at the Tower of London, visit for free. 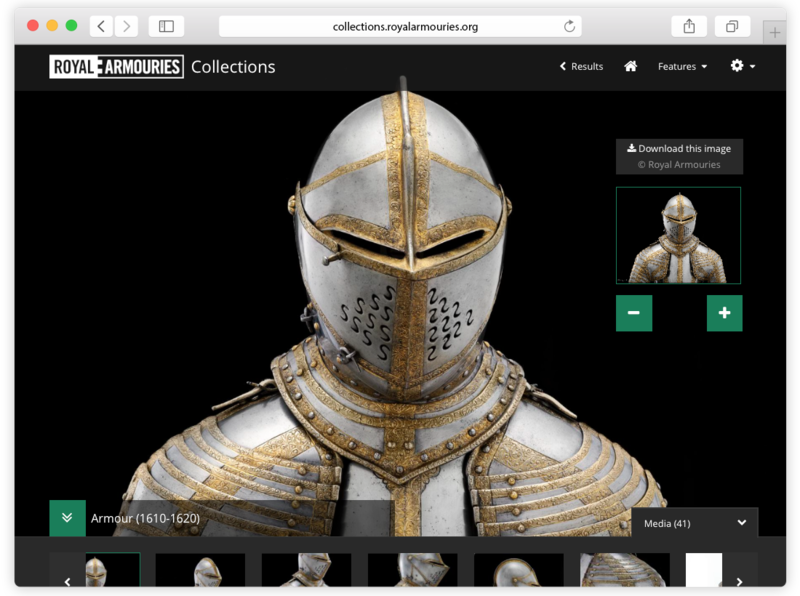 The Royal Armouries needed a partner who could use their expertise and experience to deliver a world class web user interface to give the public access to the Collections site for research, educational and personal interest use. They needed the Collections website to give unprecedented access to their archives and feature large images of their collection objects with detailed information and history on that item, all that were unavailable online until now. Features required included the ability to search and examine items from the collection, data visualisations, as well as fast autoloading of content, related media and detailed object information. Gooii have been instrumental with the team at RA in the design and user experience of the collections website all in line with the RA branding guidelines. The Gooii solution is based on a mix of technologies. PHP code for page level rendering, the search interface is built using React JS drawing object data from an Elasticsearch index, aggregated from the museum’s various internal systems via Knowledge Integration’s CIIM architecture, providing the best in terms of speed of search performance and page visibility. Stuart Carrington, Digital Manager at the Royal Armouries commented that the site was ‘excellent work by the team and the support has always been superb’.